Interested in buying a flagship device running on Qualcomm Snapdragon 835 Mobile Platform? Then, here you’ll find everything related to the System-On-Chip (SOC) that powers your device. Snapdragon 835 is a flagship-grade SOC by Qualcomm, and currently, it’s one of the most powerful mobile Processors. It is the first Processor by Qualcomm that is built on the newest 10nm FinFET Technology. Some of the popular smartphones that have this Processor are Samsung Galaxy S8 and S8+ (US Version), Xiaomi Mi 6, OnePlus 5, Nokia 8, Sony Xperia XZ Premium, Samsung Galaxy Note 8, LG V30 and the Essential Phone. Let’s move onto the Specification of this SOC and then we will take a look at the benchmark scores. 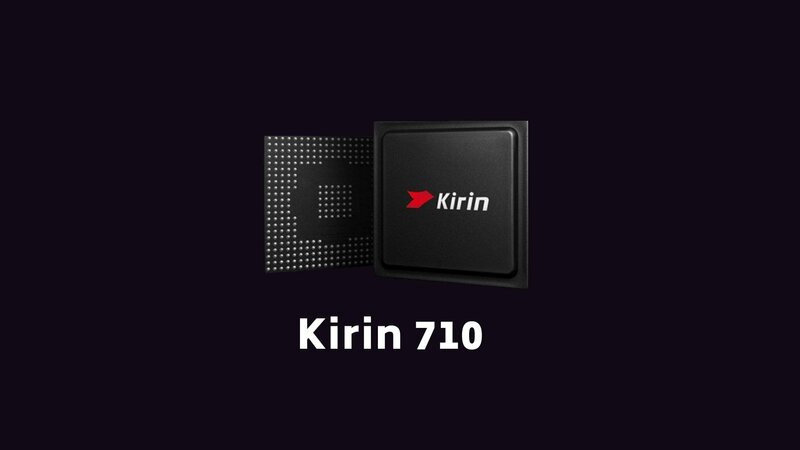 In the end, we will review the real world performance of this Processor under various aspects such as Daily-Life Performance, Extreme Gaming, Battery Consumption and Price to Performance ratio. 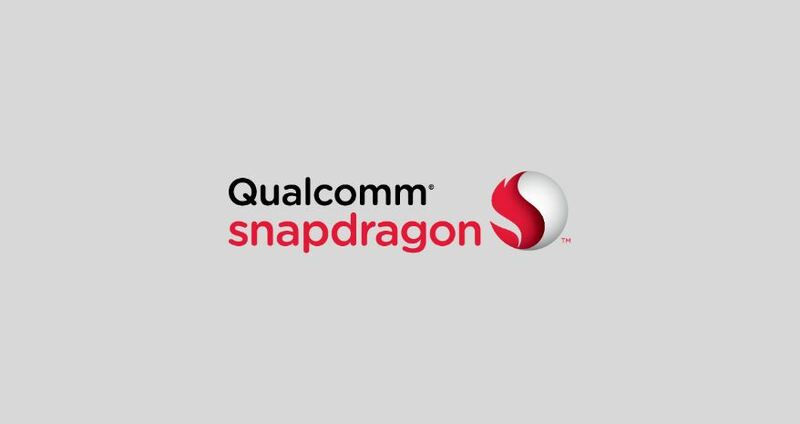 The Snapdragon 835 Mobile Platform is a 64-bit Mobile SOC by Qualcomm. Samsung Galaxy S8 and S8+ (US variant) are the first devices to use this Processor. The key highlight of the this SOC is a 10nm FinFET Manufacturing Process that we have seen for the first time in a Mobile Processor. Some other Processors that use the same fabrication technique are MediaTek Helio X30 and Exynos 8895. It is an Octa-Core Processor with eight custom Kryo 280 cores. It uses the ARM’s big.LITTLE architecture with four cores having a frequency of 2.45 GHz while the other four cores run at a frequency of 1.9 GHz. The higher clocked core cluster gets activated while performing CPU intensive tasks while the other one works while doing day-to-day life tasks. This big.LITTLE architecture conserves the power and gives a better Battery Life. It has the Adreno 540 Graphics Processor, which is currently the fastest GPU ever on a Qualcomm Mobile Platform. 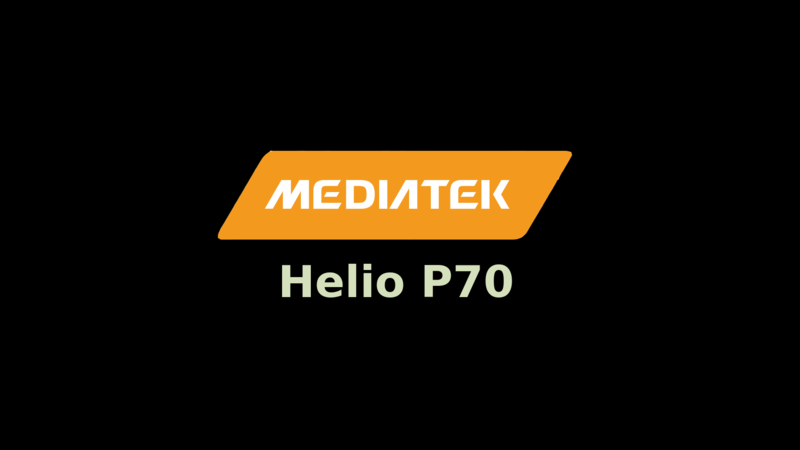 Adreno 540 has a frequency of 710 MHz, and it is a lot better when compared to its processor (Adreno 530). Adreno 540 also supports 4K (Ultra HD) display resolution. It can also play 4K videos at 60 frames per second. It supports Dual-Channel LPDDR4X RAM, and the Memory Speed is 1,866 MHz. Coming to Fast Charging, it includes Qualcomm’s latest QuickCharge 4.0 Technology. According to Qualcomm, with Quickcharge 4, one can get 5 hours of Battery Life with just 5 minutes of charging. 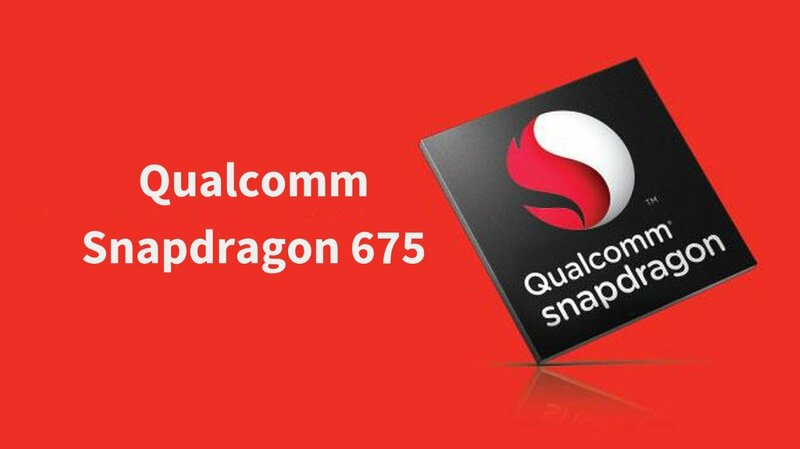 Snapdragon 835 Mobile Platform also includes the latest generation X16 LTE Modem which can give a maximum download speed of 1 Gbps and upload speed of 150 Mbps. The latest Hexagon 682 Digital Signal Processor combined with All-Ways Aware technology improves the performance and battery efficiency. It has a Dual ISP with Qualcomm Spectr 180 Image Sensor Processor. This ISP offers a high-speed autofocus and no shutter lag. It supports a Single-Camera of maximum 32 Megapixels or a Dual-Camera Megapixels. It also has support for the latest Bluetooth technology, i.e. Bluetooth Version 5. Coming to Security, the Qualcomm Haven Security Suite offers support for Fingerprint Sensor, Voice Recognization, Facial Recognization, and Iris Scanner. 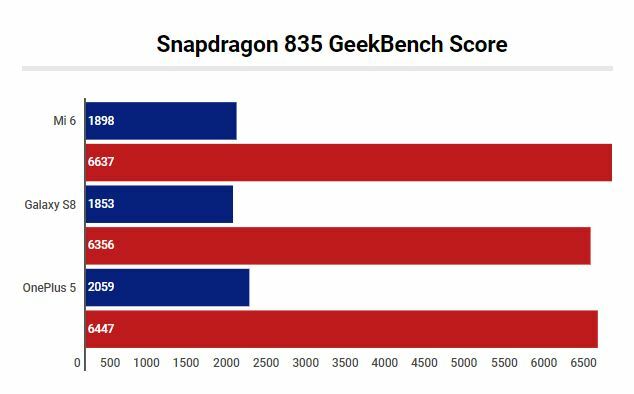 Here are the GeekBench 4 and Antutu Scores of Snapdragon 835 Devices like the Samsung Galaxy S8+, Xiaomi Mi 6, and the OnePlus 5. These benchmarks scores are simply extraordinary. Every year, the raw CPU performance gets better and better. The reason I believe that Galaxy S8+ has the lowest score is likely due to its high display resolution. As we have already discussed, the Exynos 8895 variant on Galaxy S8/S8+ is faster than Snapdragon variant. Xiaomi’s Mi 6 gets the highest score in this benchmark test with 184,292 points. 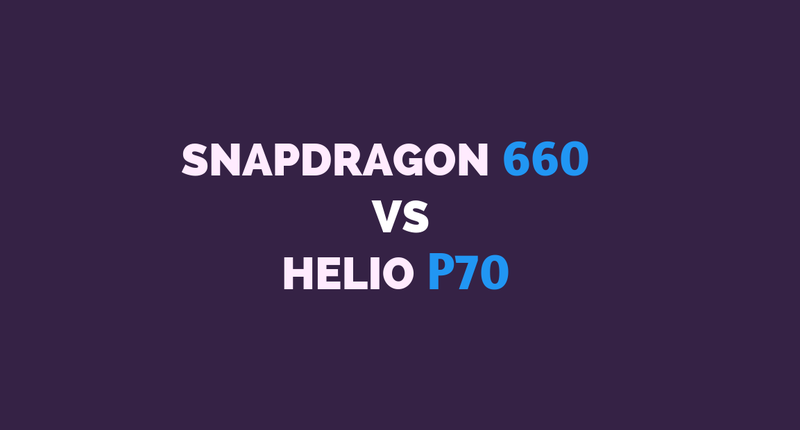 With the upcoming Snapdragon 845, these scores are likely to cross the 200k mark. In the above image, the Blue colour represents the Single-Core Score while the Red colour represents Multi-Core Score. The customised Kryo 280 cores seem to be a lot more powerful, and their multi-core performance is brilliant. However, there’s still room for improvement in Single-Core scores. The Apple A10 Fusion and A11 Bionic Chips are a lot faster. Let’s wait and find out what the future Qualcomm flagship chips have to offer. This processor is exceptionally fast and one of the most power efficient processors till date. It is sometimes hard to review a flagship product as it gets difficult to find any drawbacks or shortcomings. Moreover, there aren’t many better products in the markets which it can be compared to. In this case, we have two Processors, i.e. Samsung Exynos 8895 and Apple A11 Bionic which are better in most of the aspects. However, it cannot be considered as a disadvantage as SD 835 is also brilliant in every aspect. The highlight is, of course, the ultra-low battery consumption, fast processing cores and a GPU that supports a 4K display and 4K video playback. The Modem, ISP, DSP and other technologies like Quickcharge 4, Dual-Channel LPDDR4X are of flagship grade. Let me give my opinion about this Processor in the following aspects. In daily life performance such as browsing, multi-tasking, App switching and video playback, there won’t be an issue in performance. It will be a seamless experience to use a device powered by this Processor. Applications will open faster than the blink of an eye. Android Oreo’s Picture-in-Picture mode and Multi Window Splitscreen will improve the multitasking efficiency. Some of these brilliant Android features backed up with a powerful Processor gives a whole new experience of smartphone usage. Also, most of the flagship devices have great Camera, Audio Output, a bezel-less/infinite display which will open a whole new world of possibilities. 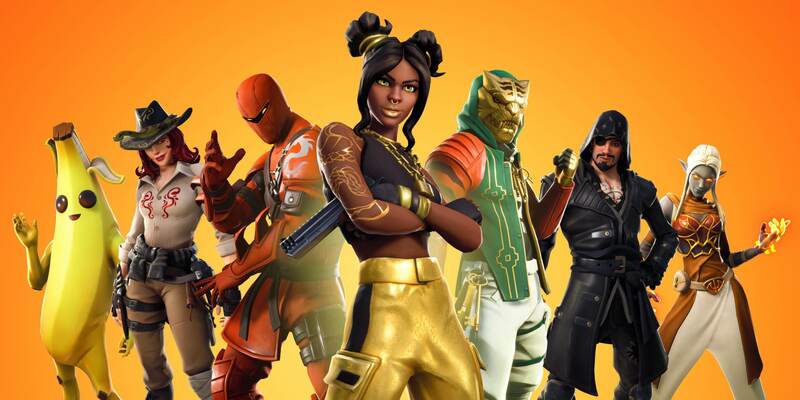 Gaming experience is going to be brilliant as well especially if you’re on a 2K resolution like that of Samsung Galaxy S8/S8+. For 1080p gaming, you’ll get even better frame rates. Adreno 540 GPU officially supports the 4K resolution, and this gives a good idea of its capabilities. Thanks to the 10nm FinFET Fabrication, you can game for hours without any throttling or overheating issues. Also, you can game for much longer durations due to the Extended Battery Life. Adreno 540 can run every game you throw at it at a very high frame rate. According to Qualcomm, the 10nm FinFET fabrication technique consumes 25% less power when compared to the previous generation 14nm technology. This, in turn, improves the battery life even without any increase in Battery Capacity of flagships. One will certainly fall in love with the Battery Life of devices running on this processor. Also, the new architecture makes the SOC 35% smaller which makes the smartphone design more compact. The Fabrication Technique also affects things like CPU throttling and Overheating. In case of this Processor, you will not face such issue at all. This SOC packs some of the latest features and technologies which smartphone performance in many ways. It supports Bluetooth 5, has a faster Dual-Channel LPDDR4X RAM, has the new generation Internet Modem that supports download speed up to 1 Gbps. Also, the new Image Signal Processor improves Image Processing and results in better picture quality from the Camera. Qualcomm’s Quickcharge 4.0 further improves the existing Quickcharge 3.0 technique. All these not so significant features when combined can create a whole new experience while using your Qualcomm powered smartphone. This section entirely depends on the price you’re buying a device. Phones like Mi 6 and OnePlus 5 offer a lot more value for money. While smartphones like Galaxy S8, Galaxy Note 8, LG V30 are brilliant in their respective price segments. In almost every price range, Snapdragon 835 devices overpower its counterparts. Snapdragon 835 is available in a wide range of smartphone starting from $450 to $950. Some of my favourite Snapdragon 835 devices are Samsung Galaxy S8+, Galaxy Note 8, Xiaomi Mi 6, OnePlus 5, LG V30. And I’m pretty sure that the upcoming Google Pixel 2 is going to be brilliant as well. I’ll surely recommend purchasing any of these phones. Also, make sure to look in other specification as well before choosing a particular phone. An overall smartphone’s quality can only be determined when you look at the full specification and see its real-world performance. Can you test CPU thermal throttling or sustained performance also?